One morning a few weeks ago, I was sitting on the side of Wrotham Hill on one of those beautiful sunny spring mornings, with that hint of freshness in the air that reminds us winter has at last gone. Bees bumbling through the clover, a blackbird chirping at me from the hedge, and I looked out across the Holmesdale Valley, the steeples of Ightham Wrotham and Platt before me, and I thought what this place is missing is a humungous railfreight depot to counterpoint the rural tranquillity. And Lo ! Someone must have heard me. Days later the story breaks about just such a depot, loads of jobs, a bypass, getting trucks off the road. What more could we want? Some churlish souls are suggesting that this is just a ploy by rapacious developers trying to cash in on a trend. Some suggest that it should be robustly opposed just to save a few fields and newts. Surely the residents of Lingfield must see that 14mtr high sheds will stop forever their problems of sand blowing in from the sandpit. The residents of Tolsey Mead and Annetts Hall should be grateful of the laboursaving fact that the sun will no longer despoil their gardens and allow weeds to flourish. School children can take educational walks to watch container straddle carriers and diesel shunters: much more interesting than a few wilted flowers and coughing birds. Never again will our High St be blocked by delivery trucks: just hordes of cheery whistling porters delivering goods on sackbarrows from our own personal freight depot. Local builders can have their gravel delivered direct from our own aggregate railhead by environmentally friendly wheelbarrows. Commuters will be relieved of having to travel on those dirty crowded passenger trains because the lines will all be used by essential freight bound for Borough Green, Freight Hub of the South. Ahhhhh! A return to the heady bygone days of the Titfield Thunderbolt, and is there honey still for tea ? 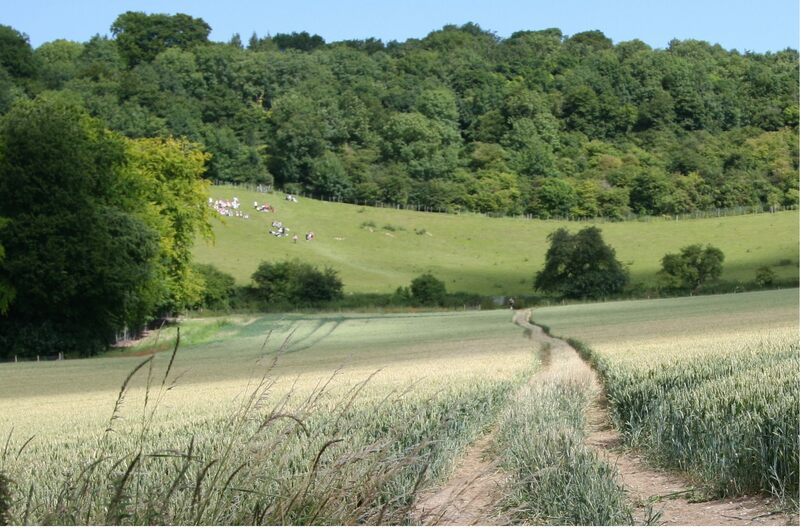 Picture Courtesy of Wrotham Secondary School Annual North Kent Downs Walk.